Dr. Jenson has been practicing restorative dentistry in Eugene for the past 36 years. He recieved his Bachelor of Science degree in Biology from the University of Oregon in 1977. He earned his Doctorate of Dental Medicine from the Oregon Health Sciences University in Portland, OR in 1981. He is a member of the American Dental Association, the Oregon Dental Association and Past President of both the Lane County Dental Society and the Emeral Dental Research Group. Through a combination of the most up to date restorative techniques, sensible phased treatment plans and a genuine devotion to the unique needs of each patient. Dr. Jenson persues healthy teeth, alleviates oral discomfort and improves the appearance of smiles on a daily basis. A dentist with a grasp of the most innovative minimally invasive procedures, Dr. Jenson is dedicated to lifelong learning through continuing education courses. 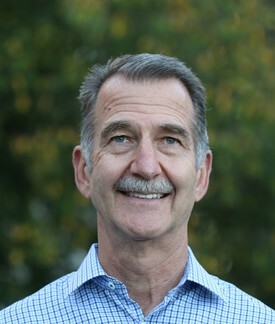 He has been involved with dental reconstruction using implants for over 25 years and is one of the few dentists in Lane County offering Nobel Biocare's "All on Four" full mouth reconstruction. This procedure allows for the reconstruction of the entire jaw in one day. Dr. Jenson and his wife, Kathy have been married for 40 years and have five children. He enjoys snow skiing, biking, and golf in his leisure time.